Tell us your statistics question, and we’ll connect you with an online tutor in seconds. Get expert statistics help anytime, anywhere. Whatever you're working on, your online tutor will walk you step-by-step through the problem and the solution. Check homework answers, solve a question you're stuck on, or let us help you study for your next statistics test. Watch how it works. 96% of students say they improved their grades with Princeton Review tutors. * Our online classroom is equipped with all the tools you need for homework success. 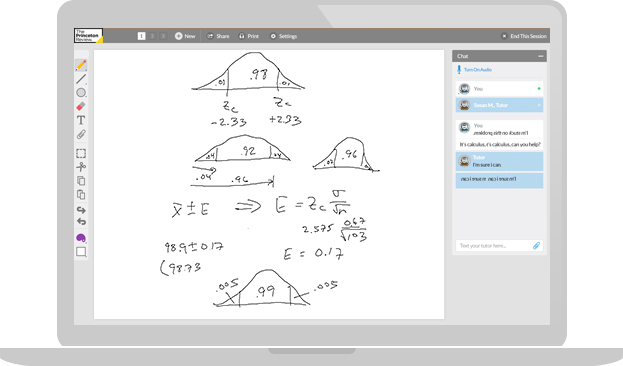 Upload a problem set, practice drawing distribution curves on the interactive whiteboard, and chat with your tutor until your statistics question is answered. Get 24/7 statistics help—no appointment needed. Our statistics tutors are online now.